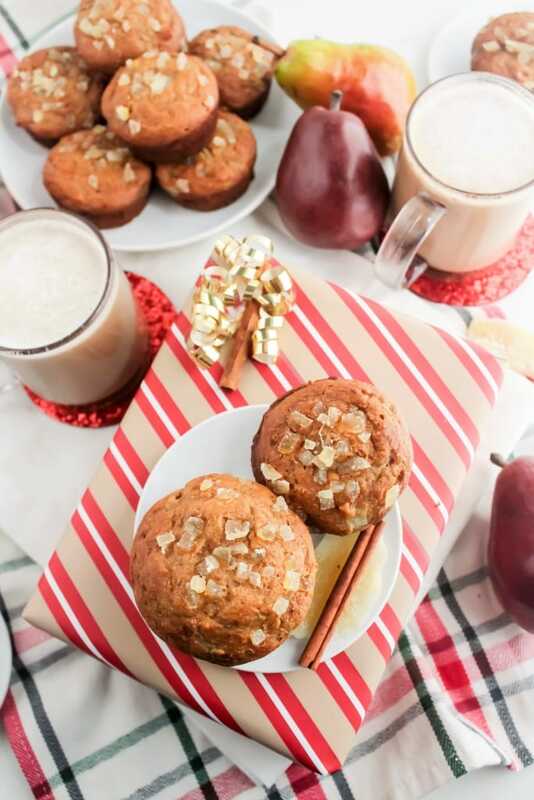 These moist and fluffy Pear Ginger Honey Muffins are lightly sweetened only with raw unfiltered honey, making them a great option for a non-sugar coma inducing holiday baked good. Enjoy them as a snack or a yummy make-ahead breakfast! Thank you to Aunt Sue’s Raw & Unfiltered honey for sponsoring this post. Their raw & unfiltered honey is available in two varieties, clover and wildflower. I used the wildflower here, but feel free to mix it up – each has their own flavor notes, but boast the same benefits, like antioxidants. 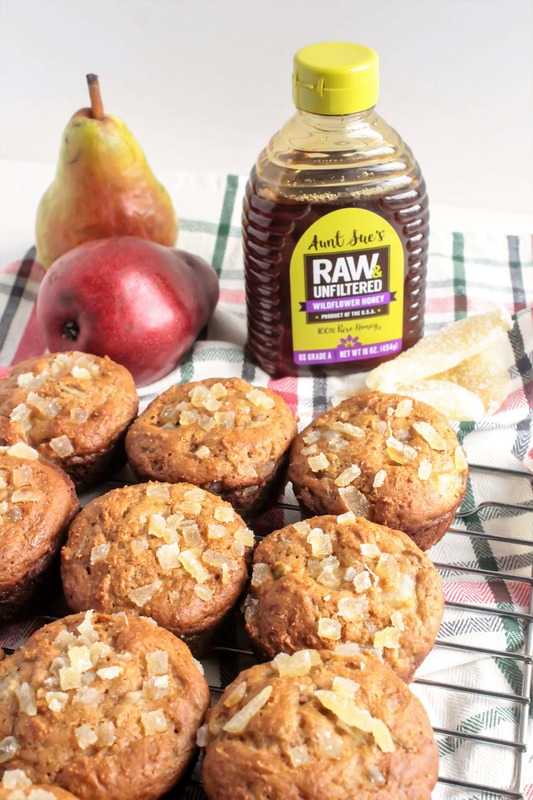 Either way, the flavorful honey flavor pairs perfectly with the ginger and pear in these muffins – one of my favorite flavor combinations! 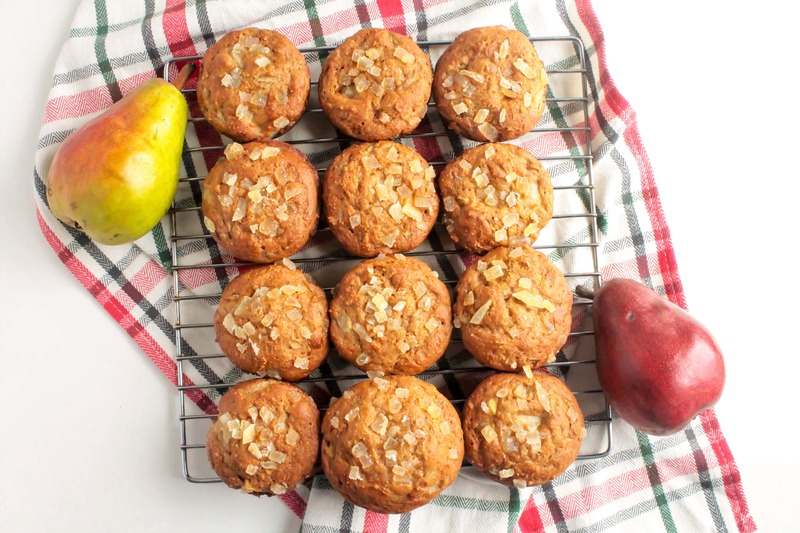 These muffins are also made with 100% whole wheat pastry flour (you can sub white whole wheat flour instead, but don’t use regular whole wheat flour – it will make them too dense), ground flaxseed, Greek yogurt and lots of fresh pears. The result is a healthy, filling breakfast (or snack!) that doesn’t sacrifice taste or texture. Like most of my recipes, this one is super easy to put together. Just mix together the dry ingredients and wet ingredients separately, then mix them together and fold in the diced pears. 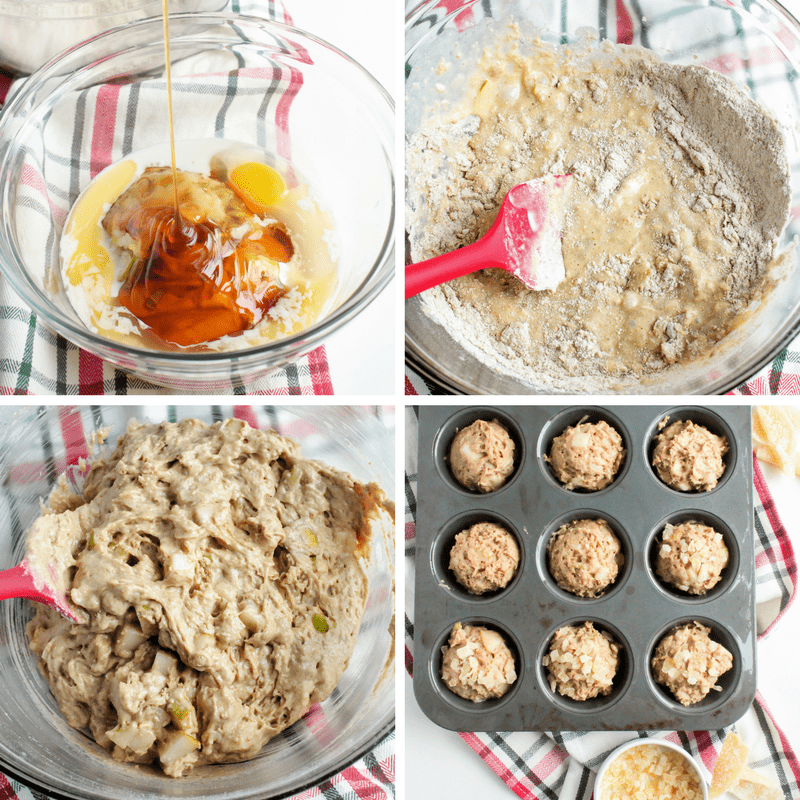 I normally love topping my muffins with raw oats before baking (just to make them pretty! ), but this time I opted for spicy-sweet crystallized ginger. The crystallized ginger on top (along with the ground ginger in the batter) adds a nice kick to balance out the sweet pears and honey. Heat oven to 350 degrees F. Grease a 12-cup muffin pan or line with paper liners. In a large bowl, whisk together the dry ingredients (whole wheat pastry flour through ground ginger). In a separate bowl, whisk together the wet ingredients (grated pear through almond milk). Add the wet ingredients to the dry ingredients and stir just until the dry ingredients are moistened. Add the diced pear and stir to distribute evenly. Divide the batter evenly between the 12 greased muffin cups and sprinkle with crystallized ginger. Bake for 18-20 minutes, until the muffins bounce back when lightly pressed and a toothpick inserted into the center comes out clean. Have a wonderful rest of your holiday season, my friends! These look delicious! Before we had to mostly go gluten free I used whole wheat pastry flour all the time, it creates a nice texture in muffins but is healthier than refined flour! Yeah, I just love the texture! It’s been my go to for many years! Won’t heating the raw honey destroy a lot of the nutritional benefits? Hi Mary – good question! Raw honey is impacted by temperature similar to the way cooking vegetables at high temperatures minimizes vitamins and nutrients – there is definitely an impact, but certainly not all of the nutrients are destroyed. 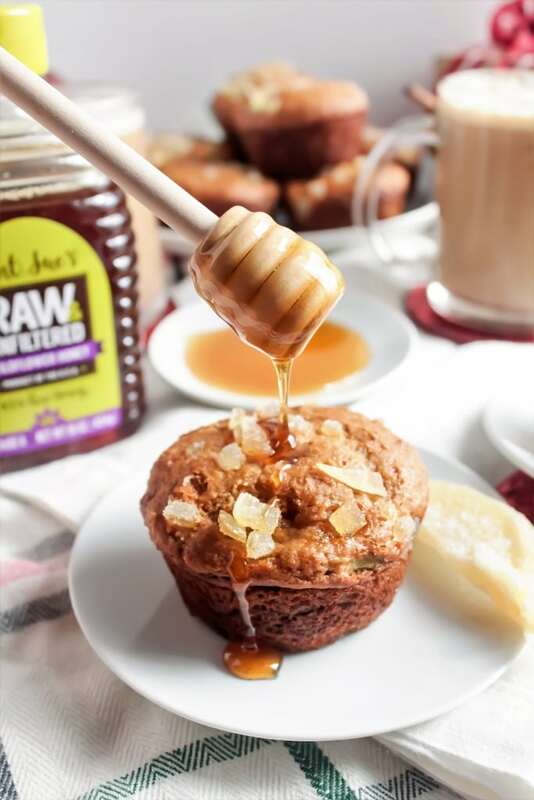 Drizzle some of the raw honey on top of the cooked muffins before eating as you see in the photos in this post – that way you’ll get those nutrients that may be diminished in the baking process… and the muffins will be extra delicious. :) Enjoy! I miss whole wheat flour! But to make these for both my husband and myself, the only change I’ll make it to use GF flour. I’ve printed the recipe and can’t wait to try them! Let me know how they do with GF flour! These looks so good. I’m not much of a pear fan when they’re on their own, but when they’re in a dish or baking I really like them. These sound amazing! I love the idea of putting crystallized ginger on top. I’m really excited to try this recipe! 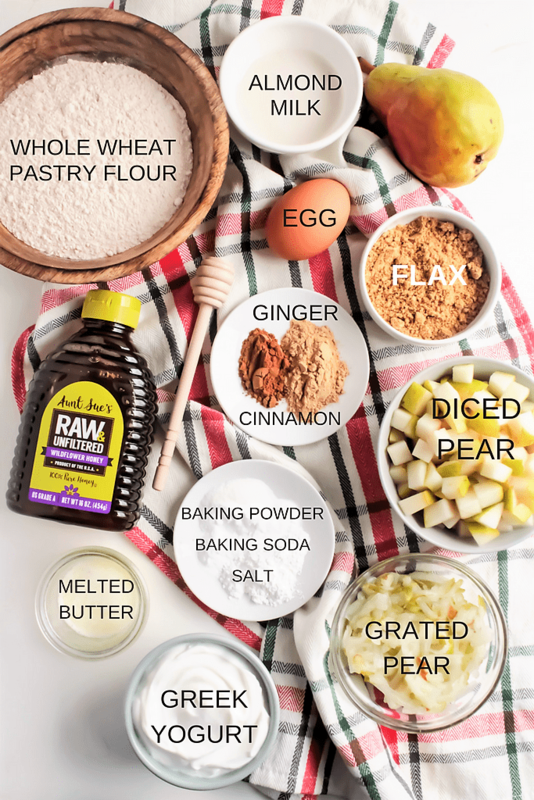 I often use honey or applesauce to sweeten baked goods so this is perfect. 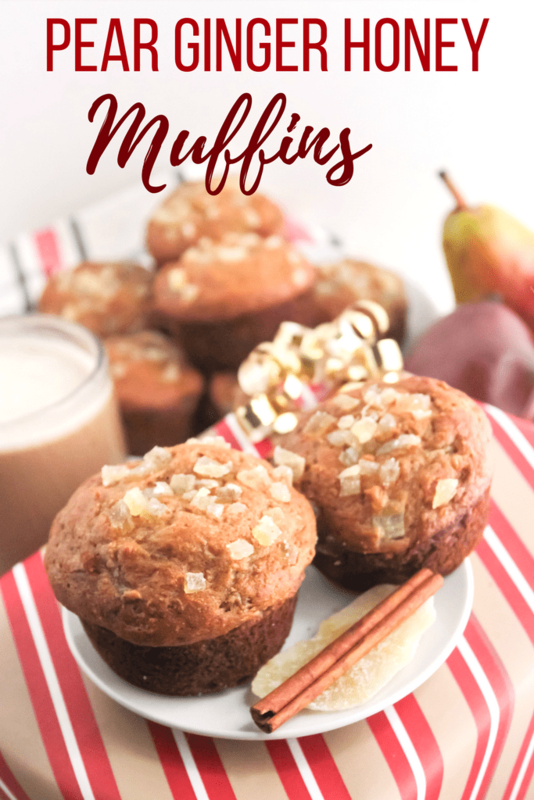 My daughter loves pears and breakfast muffins and I have fallen into a rut on making a variety of muffins. As for honey – we use it all of the time. My kids love it when I make homemade honey mustard sauce! Another super looking concoction! Cannot wait to try them! My 2 year old loves these! I use 1 cup oat flour and 1/4 cup regular flour and they turn out great – probably a little more tender with the oat flour, but we don’t mind. can almond flour be substituted? I’m not sure — give it a shot and let me know how it comes out! i don’t see eggs in the recipe but they are in the picture. Good catch – thanks! Just edited the recipe – it’s just one egg that should go in with the wet ingredients.